Spanish moss (Tillandsia usneoides) makes excellent decorative soil covers for potted plants. It is an air plant and a member of the Bromeliad family along with the pineapple. The fibrous grayish-green epiphyte is found hanging on trees in the Southeast and tropical America. It was referred to by Indians as "tree hair." The plant is commonly found on oak and cypress trees, but can grow on many other plants as well. This moss is believed by many to be a parasite plant; however, this is not so. Although it is found clinging to the branches of trees, it does this for support only. This epiphytic plant makes its own food from nutrients and moisture that it captures from the air. You can top dress your orchids and other indoor houseplants to make a beautiful impact by hiding the exposed dirt. You can purchase the moss already clean and processed and ready to mulch around your houseplants, or you can collect it yourself from the trees. Be aware, as these plants can harbor some unpleasant guests. Because the moss comes from the outdoors, it is known to house "red bugs", chiggers, spiders, thrips, and dozens of other insects. Make sure the first thing you do is remove the critters by shaking them out. When used indoors, you must boil the freshly harvested tree moss. First, separate it into manageable sections and boil it for about one to two minutes. Lay the moss out on a flat surface to dry. This process emits a foul odor, so open the windows. Boiling is necessary to kill any unseen insects to prevent an infestation indoors. You can also dehydrate it in the microwave oven for one to three minutes. Use the SuperMoss (25325) Forest Moss Preserved, Fresh Green, 3lbs to fill in the empty space of thin, leggy plants for a nice finished look. It not only gives a cleaner, more beautiful appearance, but it retains moisture in the soil. This can be a real asset with the dry indoor heated air during winter. It can also discourage pets from digging in the soil when mulched over mesh. This should be great news for cat lovers! 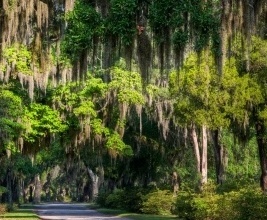 Spanish moss can also be used to line your outdoor wire hanging baskets to prevent the soil and plants from falling through the wire frame pieces. It is porous enough to allow some drainage from the basket while retaining enough water to keep the soil moist. Annual flowers work best in this type of hanging basket, as there are no worries about plant storage over winter.